Infinite Pics Song Answers, Cheats, Solutions for 100 Levels for the game. We included the screenshots for every level for you to solve the game easily. This game is developed by Conversion, LLC and Random Logic Games. Infinite Pics Is The Latest Guessing Game From Random Logic Games! It Features Hours Of Word And Trivia Gameplay As We Put Your Image Association Skills To The Test! Featuring More Than 10 Categories (Such As Sports, Movies, & Celebs) Each With 100 Puzzles. 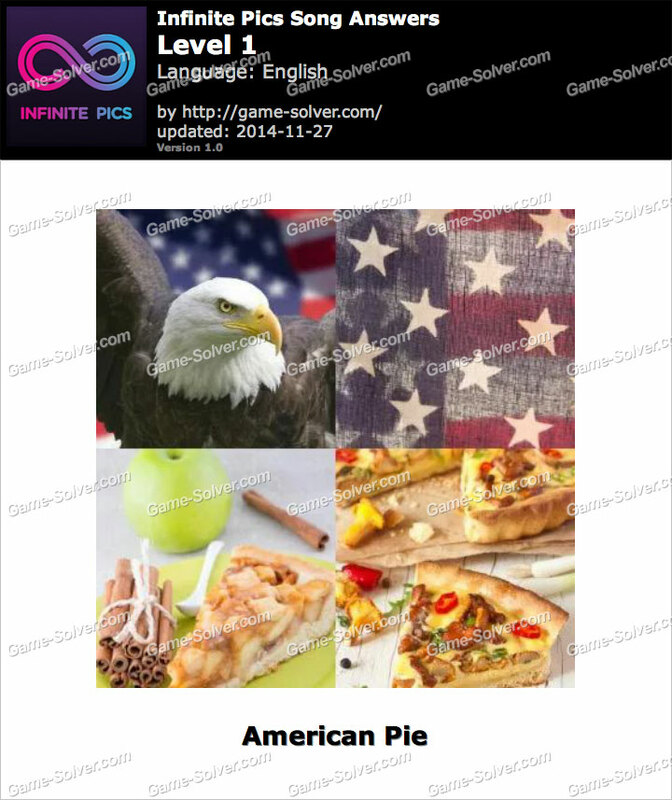 Infinite Pics Is Full Of Puzzle Fun And Trivia Entertainment. We Are Adding New Categories All The Time! Launching The App Will Show You A Covered Image With 4 Sections, A Word Bank, And The Blanks! Your Goal Is To Fill In The Correct Response For The Image Up Above. You Can Remove The 4 Covers From Each Image One At A Time – But Keep In Mind, The Fewer Sections You Remove, The Larger Your Reward! Expose A Letter Reveals The Next Correct Letter! Remove Letters Takes Away Some Unnecessary Letters! Solve The Question Gives You The Answer So You Can Skip To The Next Puzzle! This is the answer for Infinite Pics Song Level 1 with Cheats, Solutions for the game. This included the screenshots on the level that you to solve the game easily. This game is developed by Conversion, LLC and Random Logic Games.